Previously, Leoben gets a kiss and a knife from Starbuck. Jammer regretfully joins the New Caprica Police. No one seems to realize that Gaeta is the mole. Resistance mole Ellen Tigh takes the big sleep. Baltar left with the Cylons. Galactica. The Circle, also known as the Resistance leaders, drag a trembling Jammer into a viper launch tube. His charges of treason and murder stack up fast. He pleads his case to the Chief, telling him that he saved Cally. But it’s not enough. They walk away and vent Jammer into space. The Chief confirms Jammer’s version of the story with Cally and feels remorse. 41,435. I’m so excited the number is back. It changes every week. Baltar sits on Colonial One in front of Roslin, Adama and Tigh. They decide to pardon Baltar for his actions. Figment Six yells at them, pointing out his traitorous ways. Baltar grunts for his Figment to hush since they can’t hear her…until Adama responds to what Six says. Roslin starts to put a move on Baltar when he realizes he’s just dreaming. He wakes in a blurry, metallic room. The glowing red light in the back is a nice throwback to the original series. He stumbles around his room and puts on a robe. A Centurion guards the door. Baltar is on a baseship with the Cylons. Galactica. Anders awakes and tries to kiss his wife, but she blows him off. Whoa, Kara, if you’re not kissing Anders, send him this way. Yeah Starbuck is going to be messed up for a long time. On Colonial One, Roslin addresses Tom Zarek as “Mr. President.” That’s right, he was Baltar’s VP. He offers to make Roslin his VP, then resign so Roslin can legally take President again without an election. For his goodwill gesture, Roslin offers him her VP position with googly eyes. Run, Laura, run. Gaeta walks back into the CIC, his former home. Tigh throws a temper tantrum and tries to kick him out. Helo intervenes. Adama allowed Gaeta in to help put the CIC back together. Tigh’s fit continues and Adama escorts him to the door. Angry Drunk Tigh is back. The Circle votes on more collaborators. Everything’s peachy till they get to Gaeta. Anders and the Chief are not down with the plan. Anders quits the Circle because there’s no hard evidence against Gaeta. They can’t convict him because they need six votes. Baseship. Xena tells Baltar that he’s only alive because the Cylons can’t decide what to do with him. For a “superior race” they sure do argue a lot. Six is the holdout vote. Her vote will seal his fate. Six comes to his room to break up with him. Apollo informs Adama about the missing people, including Jammer. Fat!Apollo jokingly remarks that he has a date with a jumprope. Adama answers “Keep jumping.” Hee. Starbuck joins Gaeta for lunch. Steam slowly seeps from her ears. 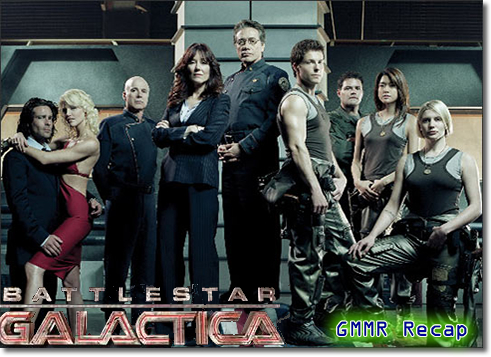 Gaeta tries to defend his role on New Caprica including that of the mole. I miss the old days when Starbuck just threw punches at the people she hated. Instead, she takes Anders place in the Circle. She finds out the Circle is a legal jury signed by President Zarek. She votes guilty on Gaeta. They put pressure on the Chief till he caves. Anders pulls Kara out of the meeting to get her to stop. Kara’s in so much pain she tells Anders to leave. He returns her dog tag and she kisses him goodbye. A piece of my heart breaks slowly. Gaeta is snatched in the hallway and taken to a viper launch tube. His conviction is read. Gaeta refuses to talk or beg. He’s tired of explaining himself and knows it will do no good. The Circle leaves but Kara’s enraged. She kicks him and tells him to beg and to tell them about the dog bowl. The Chief comes running back. Gaeta’s story confirms he was the source so the Chief lets him go. Meanwhile, Zarek tells Roslin and Adama about the secret jury. Zarek signed the death warrants so Roslin wouldn’t have to deal with these people. Roslin cares more about the law. The googly eyes are over. Roslin is sworn in again as president and issues an immediate full pardon for any collaborators. Gaeta, wearing his Colonial uniform again, eats alone until the Chief joins him. I know I’m totally missing out on a great show….but I don’t want to just pick up in the middle! Sigh. Rent the DVDs! It’s completely worth it.